In the year 1995, when I started surveying the sacred groves of the various districts of Tamil Nadu including the Nilgiris, I came across a magnificent shola in the village of Benagudi which is situated about halfway between Kotagiri and Coonoor. My curiosity was aroused and I determined to explore this particular shola. The local people tried to dissuade me, saying that the place was infested with wild animals. Unmindful of the warnings, I entered the shola. There is a single pathway which leads to centre of the shola. I followed it and walked – even crawled – to reach the centre spot. There I found a very interesting five-tiered hero stone which is protected by the local Irula tribe. From the centre, I was able see the thick, luxuriant foliage within the shola. When I went around the area, I found a stone stating that “It is a protected monument of the Archeological Survey of India”. This notice seems to have been placed there during British rule. The hero stone was sheltered by a stone platform. I tried to take photographs but I could not do so in a standing posture. However, I lay down and took photos from different views. When I came out of the shola, I perceived a crowd of village people waiting for me. It was evident that they did not expect me to come out alive. This is the so called Benagudi shola which is situated between Kotagiri and Coonoor via Aravenu. The nearest human habitation is the village of Benegudi. The area of the grove is roughly 612.24 ha. Out of this, a 22.47 hectare patch is legally protected. This shola is owned by the Irula tribe. It is situated in a hilly terrain that is thickly forested. The soil is black and sandy in nature. There are also about 50 species of trees which grow up to two storeys in height, an equal number of shrubs, ferns and climbers and a rich variety of epiphytes including orchids and lichens. About a score of mammalian fauna as well as several reptilian species inhabit this shoal, which is surrounded on all sides by tea plantations. The shola is significant in that it contains ancient cromlechs, stone circles, etc. These monuments are of religious significance to the indigenous tribal people of the area. Of particular interest is a group of seven dolmens (sila kallu) or sculpted stones revered by Badagas and bira kallu or hero stones revered by Kurumbas and Irumbas. The grove is dedicated to the Pancha (five) Pandavas, represented by the hero stone. The Irula have also appointed their own trustees to maintain the grove. The grove owes its conservation to the fact that it gives them shelter as well as foods like honey and rhizomes. They also prepare fresh frankincense from the grove. Also, the grove harbours plants of medicinal value. From the neighbouring village, people enter the grove in order to collect minor forest products. Hence, the Irulas have created a false fear of attack from tigers and leopards in order to scare them away. A festival is celebrated by the Irulas and Badagas during the Tamil month of Chithirai (April – May), when they worship the 5 Pandavas who are believed to protect the shola. There are some dolmens which are also worshipped. Goats and fowl are sacrificed and the meat is distributed as prasadam among the devotees. In the heart of the Benagudi shoal, there is an odd little shrine to the Pancha Pandavas and Kariyaraya, consisting of a broken stone hut surrounded by a low wall (or cromlech) and some sacred water. The cromlechs – or hero stones – are referred to by different names by the tribals of the Nilgiris, such as silakallu, birakallu, virakallu, maha sahkallu, kokallu and Basuvappa. It is odd to find this little memorial to the 5 Pandavas of Mahabharata fame in this remote Nilgiri forest. How these people came to revere these ancient heroes is a matter of wonder and conjecture. In the Nilgiris, ‘hero stones’ are found depicted either on orthostat slabs of megalithic dolmens or on a separate rectangular slab of stone known as ‘bas-relief ’, or as singular three-dimensional depictions. The hero stones in bas-reliefs occur either as single panels or as multi-tier panels. In general, the three-tier hero stones of the Nilgiris show, on the lowest tier, the heroic activity of the deceased (and this is normally shown as close combat). 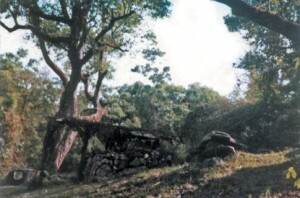 Kotagiri Taluk of the Nilgiris has a number of hero stones in the sacred groves at Betlada, Aravenu and Moonukodu. A couple of four-tier hero stones exhibiting some exclusive features have been identified at Betlada. Sati stones are common in Coimbatore, Dharmapuri, Erode, Nilgiri and Tiruvannamalai districts. These stones are mostly worshipped in Dharmapuri and Niligiri districts. It is interesting to note that sati stones are found frequently in the tribal areas of Tamilnadu, making us wonder about the origin of this practice.